Boss OC-3 Super Octave, features Overdrive & Polyphonic Mode For Chords, boxed with manual - 40. I only used the Meridian about 3 times because I quickly realised I needed a switchless wah. So I just bought a Morley Dual Bass Wah and now the Meridian and Dan-O are surplus to requirements. I'm out of town so I have left the pedals at Captain Tom's studio. If you're interested that's the place to go, just ask at the desk and gleefully give them your hard-earned. I'll take the Super Octave pedal and i'll be in past captain tom's soon with the dosh! I assure you the pleasure is mine, good sir! 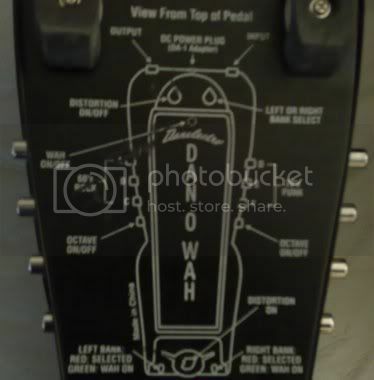 might i just add to buyers that the morley wah is a brilliant subsitute for the dunlop/vox i use one for early pink floyd type stuff and its actually alot more closer to the very old vintage vox wahs than the cry baby i reccomend it and for that price its a steal!! Slight problem there...the morley aint for sale! does crazy things to a man i tell you . 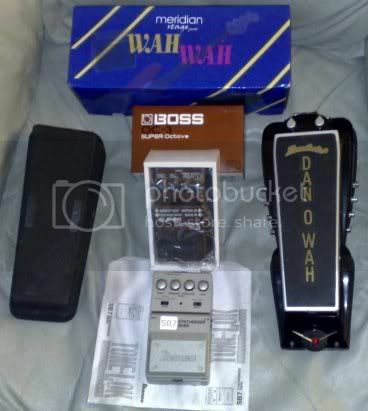 The Dan-O-Wah is indeed gone as is the Bass Synth. The Super Octave & Meridian Wah still available. So come on folks, do the right thing and help these poor unfortunate effects find a loving home. Or even an unloving home, I don't care, just buy the bloody things already!!! Okie dokie OC-3 sale hopefully pending, Meridian Wah is now sold. All now off to loving homes!